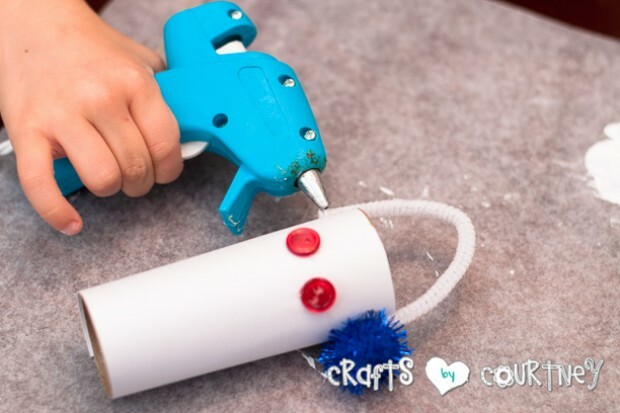 These Cardboard Tube Snowmen are a great craft for youngsters and the supplies are simple to accumulate and use. You probably have most of them in your home already. To get started, you’re going to need toilet paper rolls!! Just decide how your going to cover your rolls. I have paper and paint in the getting started picture, but we also used felt. I grabbed some buttons and orange card stock for their faces. I used white card stock and traced out my toilet paper roll. I wanted make sure the toilet paper roll was completely covered with paper. He hot glued on the eyes, nose and mouth. I cut out orange card stock for the “carrot” nose. I did a couple different styles for the hats. My 5 year old wanted ear muffs. We cut a pipe cleaner to the length we needed and hot glued it into place. Then, we picked out some SPARKLY pom pom balls and hot glued those to the bottom of the pipe cleaner. Then add the ear muffs to your snowman. Hi, I'm Courtney! I am a mommy to 3 great boys and wife to a LOVING husband. Crafts by Courtney is where I make easy-to-follow craft tutorials, and post all the DIY parties I've made!